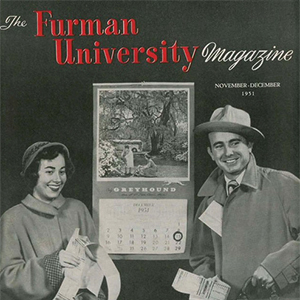 First published in December 1951, the Furman Magazine contains rich historical content about the consolidation of Greenville Woman’s College and the old campus of Furman University, the construction of the current campus, and the accomplishments of University professors, alumni, and friends. Recent issues of the Furman Magazine have the “Class Notes” section redacted for privacy purposes. This collection contains all issues of the Furman Magazine.